The Rebel Sweetheart. : Lavish and Luxurious | Pevonia Botanica Dry Oil Body Moisturizer. Lavish and Luxurious | Pevonia Botanica Dry Oil Body Moisturizer. Pevonia Skincare Philippines is a generous giver. They're having giveaways left and right - almost on a bi-weekly basis, I reckon. I'm a regular when it comes to joining giveaways, and when I learned that I won the July 12 giveaway, I was stoked! Not only did I win a prize, I actually bagged one of the most coveted and best-selling product from Pevonia Botanica's Body Care/Daily Hydration line! Yes, I'm still up at 1 in the morning. An elite brand of natural skincare products, Pevonia Botanica is the choice of prestigious spas worldwide. Its wide-range of spa treatment products guarantees only the most relaxing spa experience while addressing your skin's concerns. Its 'at-home' product line gives customers the chance to enjoy healthy, nourished skin without having to leave the comfort of their homes. Thankfully for me, I was given the chance, too! My prize came in last Thursday, moments after the little man and I got home from his school field trip. The Air21 delivery guy was like, tailing our vehicle from behind. Haha! Now look, here's what I got! The Dry Oil Body Moisturizer - a lightweight, non-greasy body spray that tones, nourishes, and revitalizes the skin. It contains Safflower Seed Oil, Macadamia Nut Oil, Aloe Vera extract, and Squalene that gives the skin a protective, moisturizing veil and a radiant, healthy glow. It's also packed with Lavender and Chamomile extracts that leaves the body with a light, fresh scent. I smell a wee bit of musk here, which is good since I prefer musky scents over the fruity, floral ones. It comes with a spray pump that spritzes just the right amount of oil you need - neither too little nor too much. The packaging itself is classy looking. It's made of biodegradable and fully recyclable materials, too. Like all of Pevonia's products, the Dry Oil Body Moisturizer contains safe and all-natural ingredients. Best of all, they're a cruelty-free brand - absolutely no testing on animals. Yay, Leaping Bunny! There's so many reasons for me to love this product - from its sleek and ergonomic packaging, its aromatic scent, its all-natural, eco-friendly ingredients, all the way to the silky smooth, moisturized feel that it gives my skin. I have one grievance, though. The price! This 200 mL bottle costs a whopping Php 3,120! (See? I told you Pevonia PH is a generous giver.) So unless I win another giveaway, I have to use this luxurious dry oil sparingly, lol! 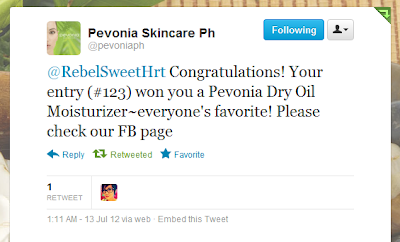 To know more about Pevonia, visit their Philippine website and their official blog. For promo and giveaway updates, like them on Facebook and follow them on Twitter. *Product was sent to me as a prize. Thoughts and opinions are entirely my own. Congrads on the win. It must be a really great product to use. I like the spritz spray pumps too. This write-up is fabulous and makes me want to indulge in spa activities, or at least a little pampering. Congrats on the great win! Looks like you won the motherload! What a generous company. Pevonia is so expensive nga. I bet literal na "wisik-wisik" lang talaga dapat ang gamit dito.